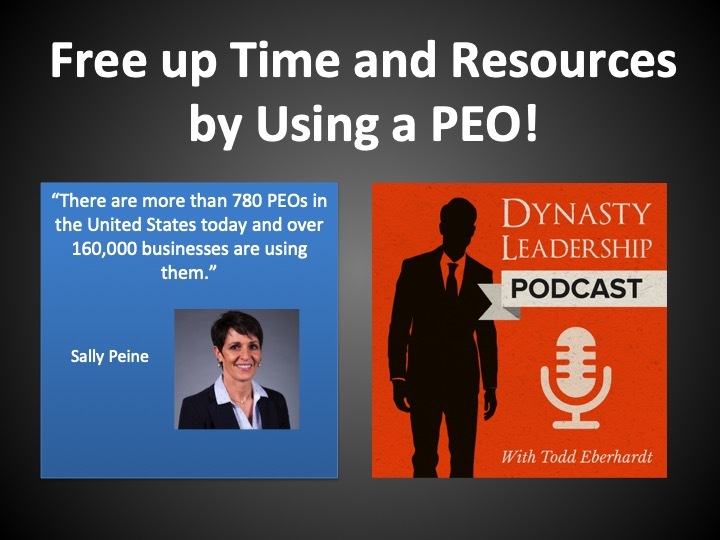 Home » Single Post » Free up Time and Resources by Using a PEO! When you are running a small to medium-sized business, it can be difficult to develop and execute a plan for business solutions and human resources. This is where PEO’s come into play. PEO which stands for Professional Employer Organization, assist organizations with payroll processing, human resources, and other business operations. On this episode of the Dynasty Leadership Podcast, Sally Peine of Insperity joins the show to discuss the benefits of PEO’s and how they help businesses. Sally has been a Business Performance Advisor at Insperity for almost two years. She works with customers to improve their business performance by guiding, advising, encouraging and mentoring for options in human resources and business solutions. [2:00] What is a PEO? [3:15] How does Insperity work? [5:40] Each situation is very custom and personal, so the cost of a service like this is difficult to determine right off the bat without first understanding specifics. [7:40] Sally shares an example of what it might look like to work with a PEO. [11:25] What happens when you have to let somebody go? [14:45] Keep your best practices and policy as clean as you possibly can. [17:35] When is it the right time to use a service like Insperity? [22:00] Insperity helps you simplify all the vendors you need for your company to run (like HR, employment lawyers, health care, etc) down to one partner. [22:40] Insperity ideally works with business owners who have between 5 to 150 employees. [23:15] Even though it’s a partnership, what kind of objections do owners typically have before outsourcing some of their key staff management practices to Insperity?